This week's blog post is written by ISU dietetic intern and graduate student, Nikki Zintak! Bring on the green! 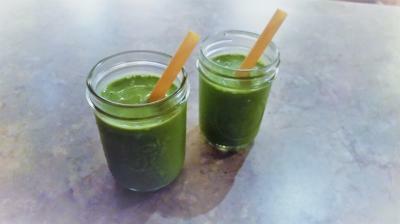 With St. Patty's Day just around the corner, what better way to celebrate than with some festive green smoothies! Smoothies are commonly made with fruit, but why not add some other healthful ingredients to get more bang for your buck? Let's pick apart a smoothie and give some good reasons to let your smoothie go green this St. Patty's Day! Ingredient #1 Spinach: Spinach originated in Iran and was found in China by 64 A.D., and in Spain by 1100 A.D. Spinach was brought to American shores by the colonists. This nutrient-packed vegetable has so many benefits for the body that it is often touted as a superfood. Spinach is an excellent source of vitamins A and K, and it's also full of vitamin C, folate, and potassium. This green shines in cancer prevention, containing chlorophyll and carotene, which are shown to block cancer-causing agents. If you don't have spinach on hand, other dark leafy greens, such as kale, would work just as well in a smoothie! Ingredient #2 Greek yogurt: Greek yogurt has been on the frontlines for quite some time now, but what is all the hype about? Greek yogurt has double the protein compared to traditional yogurt, and the yogurt is strained to remove excess liquid, therefore giving Greek yogurt a thicker consistency. With the extra protein in the yogurt, this smoothie can help you feel fuller longer. Yogurt is also packed with probiotics, or healthy bacteria that keep your intestinal tract running smoothly. Ingredient #3 Fruit: This is common in smoothies and versatile. You can add almost any fruit to a smoothie and it will taste equally delicious. Bananas are in this green smoothie recipe because it carries it's flavor very well, and the spinach does not overpower it. This recipe calls for bananas to be frozen, which when blended, they create a smooth, creamy texture that cannot compare! Not only do they taste great, but bananas are filled with vitamins and minerals, such as potassium, vitamin B6, vitamin C and more! While green smoothies may seem a bit scary, the ingredients in them are pretty basic, and they are full of nutrients that will help you become a healthier you this St. Patty's Day! Combine all ingredients in a blender. Blend until smooth without any lumps. Pour equal amounts into two cups and enjoy!